Fried chicken (also referred to as Southern Fried chicken) is chicken pieces usually from broiler chickens which have been floured or battered and then pan fried, deep fried, or pressure fried. The breading adds a crispy coating or crust to the exterior. What separates fried chicken from other fried forms of chicken is that generally the chicken is cut at the joints and the bones and skin are left intact. Crispy well seasoned skin, rendered of excess fat, is a hallmark of well made fried chicken. Left: Pieces of fried chicken. First the chicken must be cut up. Generally the chicken is segmented at the joints and the breastbone is split lengthwise. Care is usually made to leave the skin intact, though many people today remove the skin completely for dietary reasons. The chicken pieces may be marinated in buttermilk, or simply dipped in buttermilk or milk, but neither of those steps are essential. The chicken pieces are then dredged in white wheat flour (or a mixture of ingredients like: wheat or other grain flours; courser ground grains like cornmeal; and breadcrumbs). Seasonings such as salt, pepper, cayenne pepper, paprika, garlic powder, onion powder, and ranch dressing mix can be mixed in with the flour. 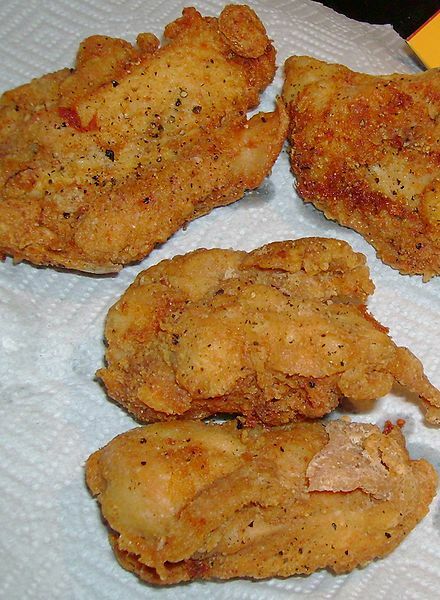 There are three basic methods which are used to fry chicken. Lard is the traditional fat, but today corn oil, peanut oil, canola oil, or vegetable oil is used. The flavor of olive oil, is generally considered too strong to be used for traditional fried chicken. Left: Fried chicken and french fries of Kentucky Fried Chicken. Pan frying (or shallow frying) requires a frying pan (cast iron is traditional) and an amount of fat that may vary by recipe and technique, usually from a quarter inch to halfway up the chicken pieces. The chicken pieces are prepared as above, then fried. Generally the fat is heated to a temperature hot enough to seal the outside of the chicken pieces. Once the pieces have been added to the hot fat and seared, the temperature is reduced. There is debate as to how often to turn the chicken pieces, with one camp arguing for often turning and even browning, and the other camp pushing for letting the pieces render skin side down and only turning when absolutely necessary. Once the chicken pieces are close to being done the temperature is raised and the pieces are browned to the desired color (some cooks add small amounts of butter at this point to enhance browning). The moisture from the chicken that sticks and browns on the bottom of the pan become the fonds required to make gravy. 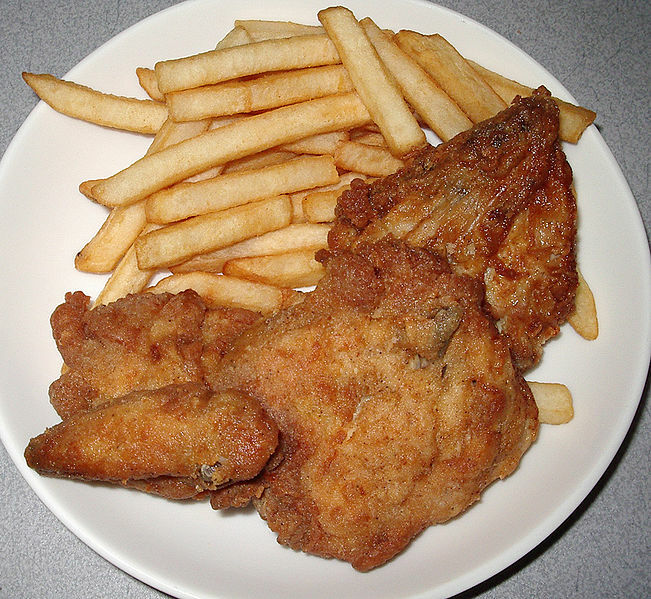 "Maryland Style Fried Chicken" is made when the pan of chicken pieces, and fat, is placed in the oven to cook, for a majority of the overall cooking time, basically "fried in the oven". Deep frying requires a deep fryer or other device in which the chicken pieces can be completely submerged in hot fat. The pieces are floured as above or battered using a batter of flour and liquid (and seasonings) mixed together. The batter can/may contain ingredients like eggs, milk, and leavening. The fat is heated in the deep fryer to the desired temperature. The pieces are added to the fat and a constant temperature is maintained throughout the cooking process. Almost like a hybrid of both previous methods, a pressure cooker is often used. The moisture inside the chicken becomes steam and increases the pressure in the cooker, lowering the cooking temperature needed. The steam also cooks the chicken through, but still allows the pieces to be moist and tender while maintaining a crisp coating. Fat is heated in a pressure cooker. Chicken pieces are then floured or battered and then placed in the hot fat. The lid is placed on the pressure cooker, and the chicken pieces are thus fried under pressure. This method (deep or shallow frying in a pressure cooker) is also known as broasting. The possibilities for seasoning combinations are basically infinite. Southern fried chicken can be prepared with the addition of many different seasonings that can evoke the cuisines of the world. Ingredients like curry powder, Chinese five spice, sesame seeds, and tandoori powder convey distinct Asian flavors not common to traditional fried chicken. While those unique creations are technically fried chicken, they are generally represented by their dominant flavor (i.e. five spice fried chicken) and are presented as distinct (either in homes or on menu's) from fried chicken.